Home » Bathroom Help Category -- Also note those subcategories in the orange navigation, above! 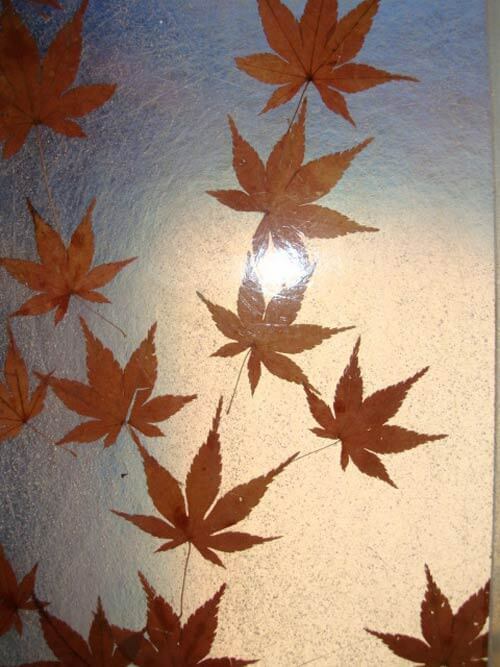 » Shower bases » Japanese maple leaf shower doors in A. Quincy Jones 1968 house — delightful! Yes! 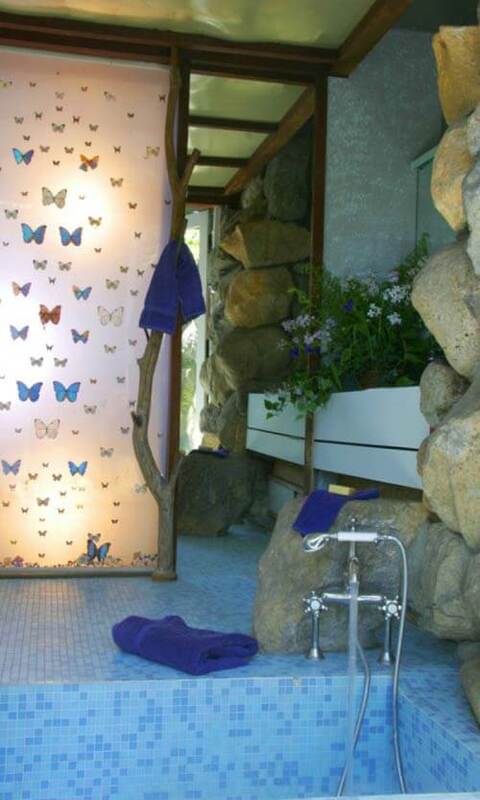 We have seen this type of thing before — the butterfly screen from the Russel Wright Manitoga & Dragon Rock historic home story is very similar to these shower doors — and equally stunning. 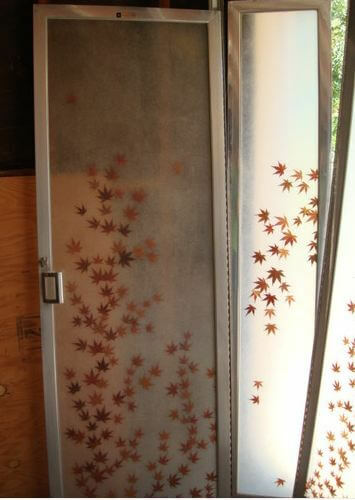 Hey, we found that the American Shower Door — the company that made these maple-leaf-embedded shower doors, still exists. The website says it’s been in business since 1935. It’s based in Commerce. Calif. We need to put it on the list to chase them down and see if they have any old catalogs or marketing materials that we can feature. We love shower doors. 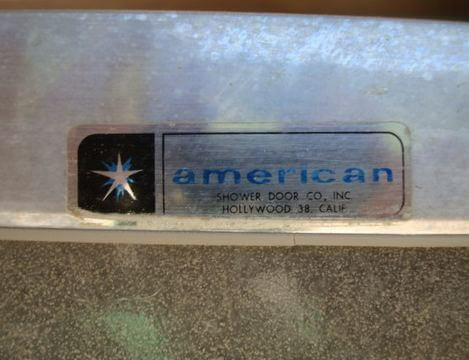 Shown here are one of three separate shower doors from American Shower Door Co. Inc. (Hollywood) taken from a 1968 A. Quincy Jones House. The frames are from what appears to be aluminum and the translucent material including what appears to be real maple or liquid amber leaves appears to be Lucite or some similar plastic. The Lucite is in good condition, but the rubber gasket needs cleaning/replacing and there is calcium to be removed from the metal. Before I restored this house, many friends begged me to sell them have the doors, but now that I’ve finally taken then out, I can’t remember for the life of me who all wanted to buy them. 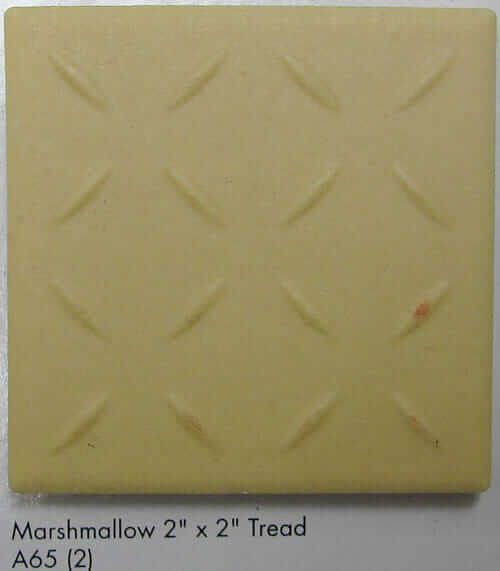 They are really kitschy and classic mid century modern for your big period piece restoration. These are in pretty good condition but will require a little restoration effort to clean them up, which I have not done. I have 3 different sets to sell, all of which are being sold separately, not as a lot of 3. I don’t want to hassle with shipping and packing, so you have to pick them up in the Los Angeles area (San Fernando Valley). This set approximately 24 x 70 with an 13 x 70 side lite. 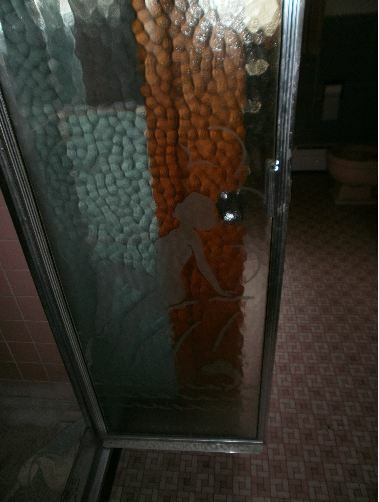 Want to see more vintage shower doors with unusual designs? Click the photo to get to a story about 10 more. The house we just finished renovating (8 years) had kind of an interesting history. An architect named Robert Homola worked for A. Quincy Jones … and so a lot of AQJ seems to have gone into the plans/design. The house itself is exactly everything you expect from AQJ, except on a much larger scale (larger bedrooms, more square footage). It is on the scenic Cold Creek in the hills above Malibu. We really didn’t want to live in a retro period piece, so we felt we had to update it and make it modern and functional, but still retain its essence. The medicine cabinets, kleenex dispensers, scale, and the shower doors will find a good home I’m sure. Who was A. Quincy Jones? According to eichlernetwork.com, A. Quincy Jones was an established architect with a career that spanned from 1945-1969. He worked worked along side Frederick E. Emmons to help produce thousands of designs for Eichler homes in California — focusing on dynamic yet livable design for the postwar moderate income family. 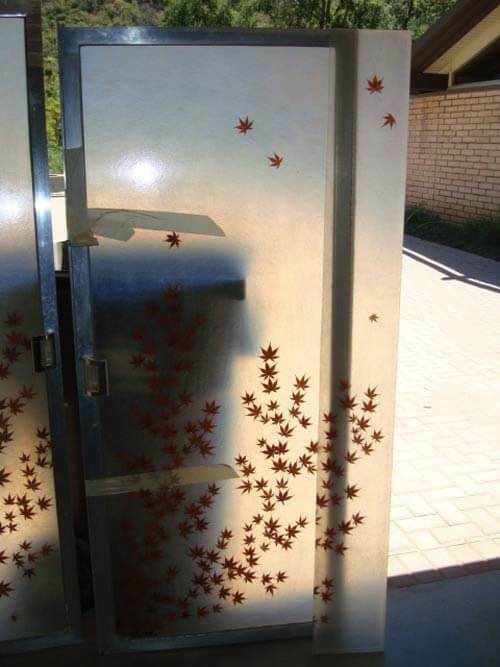 He enjoyed playing with new and different materials which, along with his love of nature, must have lead him to specify use of these leaf-encrusted shower doors. 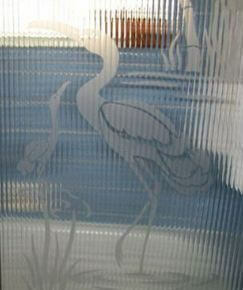 Today, this style of screen is commonly seen in commercial applications. Why not more widely in residential architecture? Whether in vintage/midcentury homes or more contemporary/modern designs, these screens would make a stunning complement to designs that seek to blur the line between the inside and outside world. Readers — where would you use panels like this? 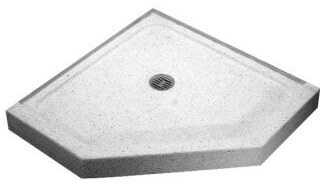 Pam, you’re right about these types of things being used today in commercial applications. In the new Agriculture building at the university I attend, they have many types of these panels throughout the building. They have ginkgo leaves and reeds, etc. I love them and they are so beautiful. I would definitely use these in my home. Those are great. I just stumbled upon and posted a cool Eichler in Orange CA that was architected by none other than A. Quincy Jones. I can see where these shower doors suit the style so well. I am lusting after the one with Maidenhair ferns, but the striped ones are gorgeous too. 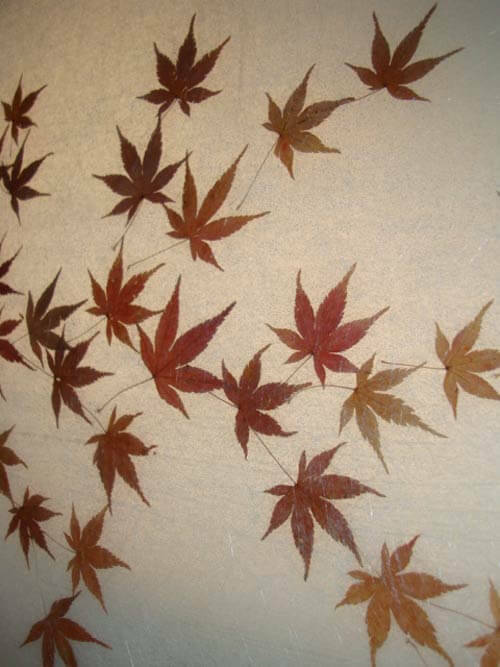 The leaves are Japanese Maples, not Liquidambar styraciflua (Sweet Gum). Beautiful. Did anyone see the pink bathroom on Dexter tonight? All I could think of is sending out this note on Save the Pink Bathroom! wowowowow! Send me photos, Matt, I’d love to see them and show them on the blog. Connect first via our contact form — https://retrorenovation.com/contact Thank you!!!! Will do Pam. Oops- fast read meant I showed my ignorance- um- A. Quincy Jones- as in design- not music ! Thanks for the education I am receiving via Retroreno..